I'm kicking off my new Inspiration to Creation series (thanks again to Shannon for the idea) with a card that I created based off of a store display. While Brad and I were away for a couple of days last week at Foxwoods in CT, we were walking through the new Tanger Outlets, and one of the stores (I believe it was the LOFT outlet) had a display that caught my eye. I loved the black, gray, white and coral with a bit of pattern, so I snapped a photo to remember the color palette for later. 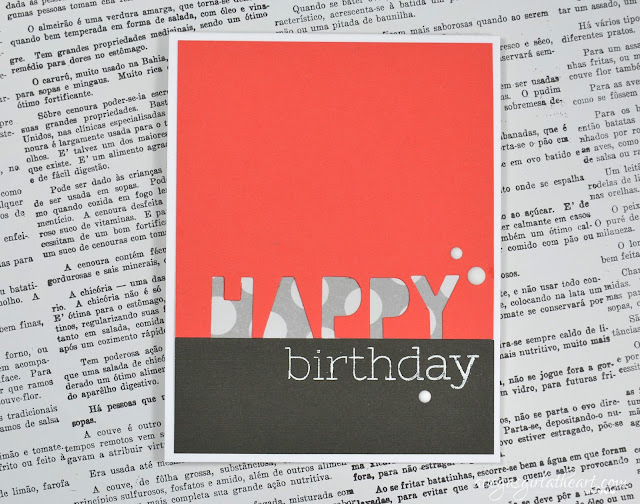 I wanted to bring in large blocks of the colors, so for the main panel of the card, I used a section of Calypso Coral card stock from Stampin' Up! and a dark gray card stock from DCWV. 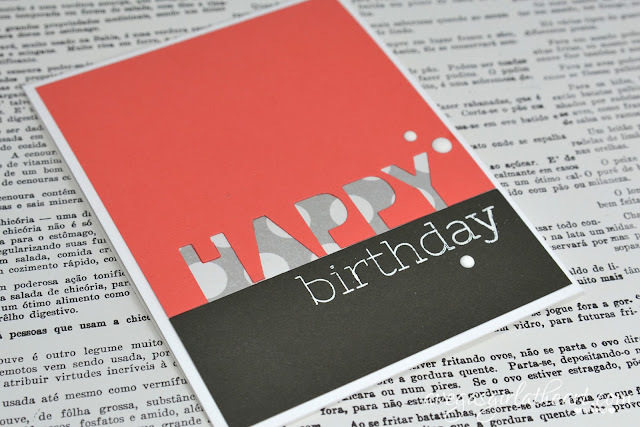 I needed a birthday card as I know several people with January birthdays, so I thought I would die cut 'HAPPY' using the Stampin' Up! Little Letters Thinlits dies. I had to run through my Big Shot twice because I only have one P in the set, but it was fairly easy to line everything up using a bit of removable tape to hold the dies in place. I just aligned them on the bottom edge of the coral card stock. On the dark gray card stock, I stamped 'birthday' using the Big Birthday Wishes stamp set from Simon Says Stamp. Because this sentiment has two words ('happy birthday'), I used the Versamarker to ink it, rather than the Versamark ink pad. That way I didn't get ink where I didn't want it. 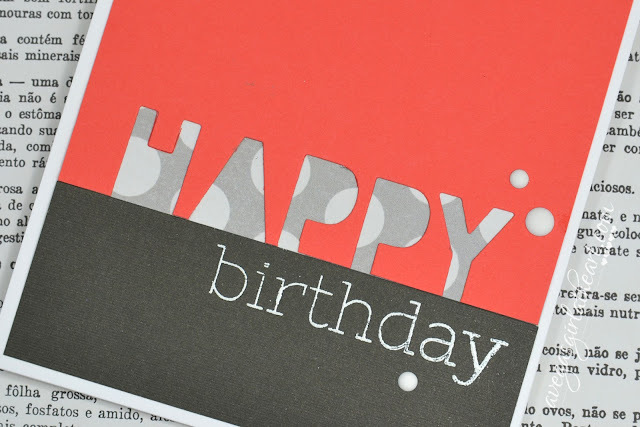 I embossed the stamped words with Stampin' Up! white embossing powder. Because the card stock is textured, the stamping is not perfect, but I think it just looked a bit distressed and still just fine. Behind the die cut letters, I'd thought about leaving just the white card base showing through, but I really wanted to bring in some polka dots, since my inspiration had that gorgeous polka dot skirt in the display. So I added a small section of polka dot patterned paper from the My Minds Eye Chalk Studio 6x6 paper pad. Then I attached both panels to my card base, added some matte white enamel dots (from Eyelet Outlet, purchased at the last CKC I attended), and the card was finished. I hope you enjoy these new Monday posts! This is awesome! I love the color combo, and I love that you snapped a photo of the inspiration! Genius!